Travel Bites are short guides designed to inform, entertain and whet your wanderlust appetite in less than five minutes. Aitutaki, in the southern group of the Cook Islands, is a popular travel destination for one major reason: the lagoon. Island-hopping among the ‘motu’, or small islets, is the number one tourist activity here. The group tours depart on a large boat during the week. They ensure you can queue up with everyone else on board to receive the quirky stamp in your passport from the fake, tourist-only post office on One Foot Island. You can relax in comfort with plenty of food, drink and shade at your disposal. That’s not the kind of experience I was looking for. 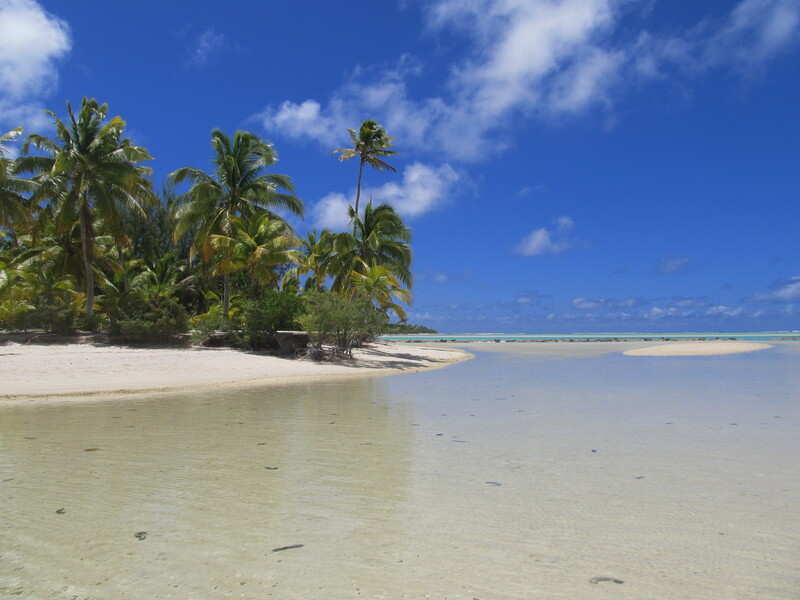 My day on Aitutaki lagoon was a much quieter affair. With only four of us on board the tiny, rocking boat we set off mid-morning on a Sunday. As the Cook Islanders are a strongly Christian nation the whole country pretty much shuts down on the day of rest. We were alone in the lagoon, the only boat for miles and the pioneers of every island we set foot on. Maybe I didn’t get my passport stamped on One Foot Island, but I did drink water from a freshly harvested coconut, wander through the interior barefoot, and look out across the aquamarine lagoon waters in wondrous tranquillity. Lunch was a makeshift picnic on the unspoilt South Pacific beach of Moturakau island. We sheltered from the punishing midday sun under postcard-perfect palm trees. This time we weren’t so alone; inquisitive chickens – considered a pest in the Cook Islands – emerged from the shade to steal a few crumbs. We all know what a paradise island looks like; even if we haven’t experienced it ourselves, we’ve all seen the photographs or wanderlust-inspiring screen savers. This is what it feels like. Prickling, sweaty heat thankfully relieved by a gentle, palm tree-swaying breeze; the smell of sun cream, ocean air and the sumptuous perfume of the local frangipane; sand burning your sensitive English feet as you hop down to the beckoning ocean; bobbing lazily in the glassy, balmy waters; the sharp taste of salt on your lips; glorious tropical warmth on your limbs; reclining on crisp sand in total relaxation. In short: heaven. It’s possible to visit even the most popular destinations and shun the traditional tourist experience. Motu-hopping in Aitutaki lagoon with a small group meant we had the power to choose where we disembarked and for how long. It gave us all a chance to indulge our Robinson Crusoe fantasies, those shipwreck daydreams any beach lover ponders from time to time.